Lots of the kids in Mr Speed’s class have something to worry about. From living with a new stepmum to failing at maths, everyone has their own private worries. But how can Mr Speed encourage them to discuss their troubles and get advice? Clever Mr Speed has an inspiration! 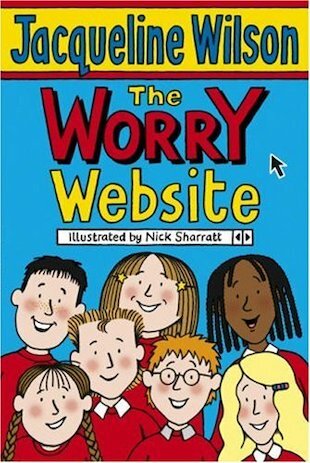 He sets up the Worry Website on the classroom computer. Any pupil can anonymously enter their worry, and anyone else can type in advice to help out… Containing six linked short stories, plus an extra story written by a 12-year-old fan, this unique creation from Jacqueline Wilson is funny, touching and wise. This book is full of problem that kids our age have to face such as if you are starting to get spots or diffuculty with a divorce. this book might help you with all sorts. I rate this book 5000 out 5000 ! I ADORE THIS BOOK I THINK THIS IS ONE OF THE BEST BOOKS I HAVE READ SO FAR! KEEP GOING Jacqueline Wilson!